The item Death in August, Marco Vichi ; [translated by Stephen Sartarelli], (electronic resource) represents a specific, individual, material embodiment of a distinct intellectual or artistic creation found in Austin Public Library. 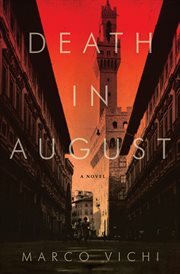 A new crime series full of Italian flavor-the first novel in the Inspector Bordelli series, set in 1960s Florence Florence, summer 1963. Inspector Bordelli is one of the few policemen left in the deserted city. He spends his days on routine work and his nights tormented by the heat and mosquitoes. Suddenly one night, a telephone call gives him a new sense of purpose: the suspected death of a wealthy signora. Bordelli rushes to her hilltop villa and picks the locks. The old woman is lying on her bed-apparently killed by an asthma attack, though her medicine has been left untouched. With the help of his young protege, the victim's eccentric brother, and a semi-retired petty thief, the inspector begins a murder investigation. Each suspect has a solid alibi, but there is something that doesn't quite add up . .